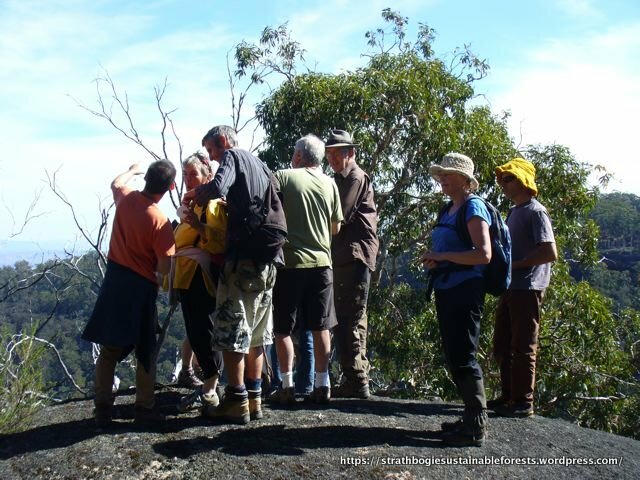 Last Sunday 15 lucky folk, younger and older, hiked through the Strathbogies to the summit of Tels Mountain. At ~1023 m, Mt Tel is just a whisker lower than Mt. Strathbogie, ~1030 m*, the highest peak in the ranges. It was a beautiful afternoon for a cross-country walk through tall, Manna Gum and Peppermint forest. Tels Mountain has extensive rock outcrops on its western slope that makes for a stark contrast with surrounding forests and wet gullies. Part of our push to get improved management of forests in the Strathbogie Ranges includes getting out into the forest ourselves. Here are some pics of the latest in our series of forest walks. 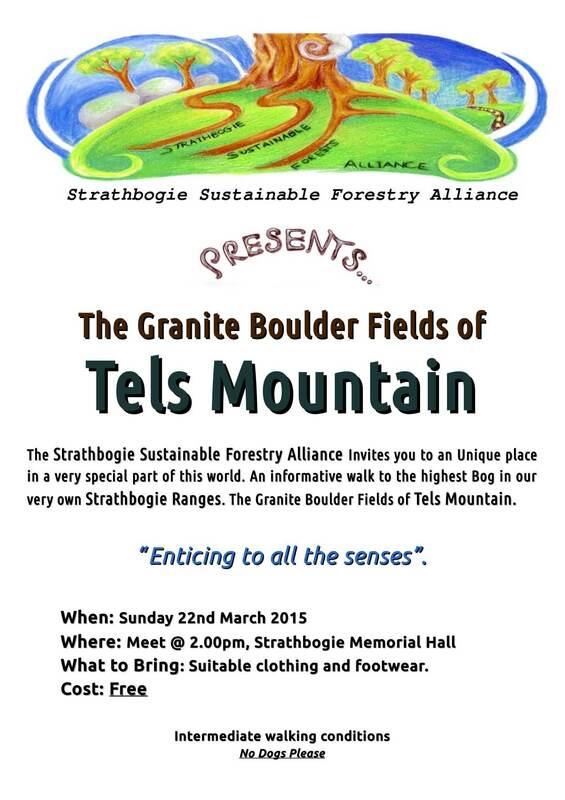 * The height above sea level of 1030 m for Mt Strathbogie is based on an on-line source . Google Earth suggests mt Strathbogie is 1036 m asl, but the official 1:100,000 topographic map gives its height as 1007 m asl. Either way, Tels Mountain is a little lower. For another view of Tels Mountain, this time from Golden Mount – visit here. The Granite Boulder Fields of Tels Mountain. The forest setting for our evening’s mothing. 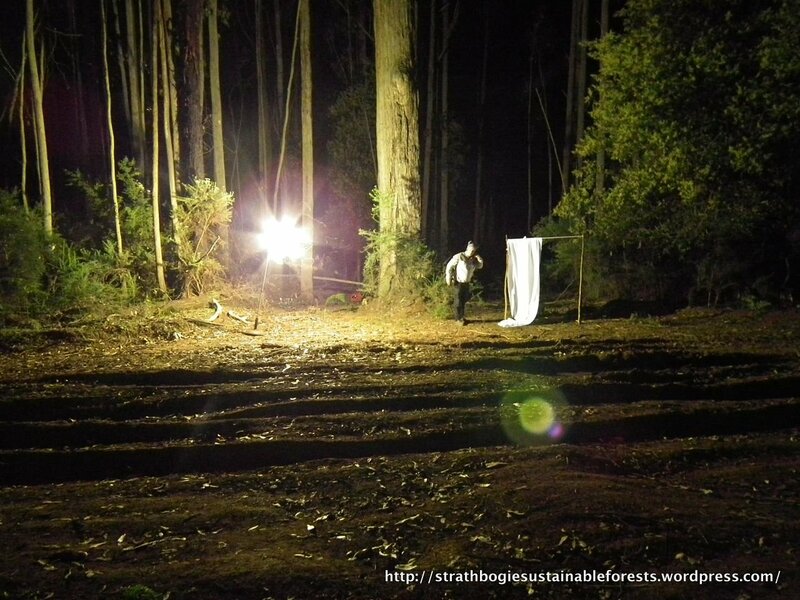 Last November’s mothing in the Strathbogie State Forest was exciting. Not only was the weather near-perfect, the site was good, the audience was excited, Steve was his usual engaging self and the moths arrived in abundance. This activity was one of a series aimed at encouraging people to spend more time in the forest, explore, learn and develop a sense of belonging. The site was along a forest track, adjacent to an area scheduled for logging. The surrounding forest sits at the wetter end of Herb-rich Foothill Forest (EVC 23) and slowly graded into Damp Forest along Parlours Creek. Messmate (Eucalyptus obliqua), Narrow-leaf Peppermint (E. radiata) and Southern Blue Gum (E. bicostata) dominate the canopy, with a dense understorey of Blackwood (Acacia melanoxylon), Dogwood (Cassinia aculeata), Victorian Christmas Bush (Prostanthera lasianthos), Musk Daisy-bush (Olearia argophylla). Moths are a poorly known group of insects, but play a major ecological role in most ecosystems – they decompose enormous quantities of plant matter, helping to reduce fine fuels and build soil on the forest floor and they are a major source of food, both as caterpillars and adults, for numerous insectivorous animals. There are about 22,000 species of moth in Australia.